For today's Midweek Romance tip, saying "I Love You" is mandatory....words, however, are optional. Here are two ways to"say" those three magical words without moving your lips! The point is to email or mail these pictures to your love while they are at work, school, etc. Another wordless "I Love You" is an idea from Becca over at Happiness is Homemade. 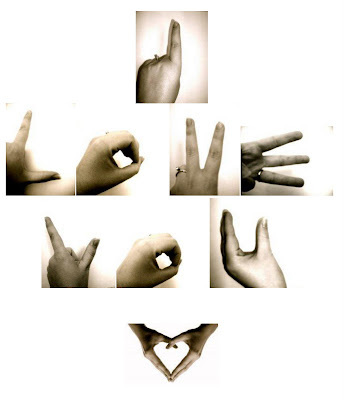 Becca took these pictures of her hands to spell it out for her hubby. How cool is that?! I think my husband would love to get a personalized version of this (with my hands) sent to his email...wouldn't yours? - Take your digital pictures and upload. - Edit them to make them look super good! Picasa is an excellent and easy-to-use editor (that edits in lots of fun ways) and you can download the program online for free HERE. - Organize the photos in a word document. (size and layer them the way you want). - Save the word document as a PDF. - Then, send your hubby an email with the PDF attached. Tell him it's a very urgent document that requires his immediate attention. Voila! You've got one happy husband/wife, boyfriend/girlfriend, fiance....and if you're not one of these...then what the heck are you saying "I Love You" for anyhow?! So cute! My future mr and I have have done this via text and it was so cute! ohhh I have done this and it was adorable!! love it Cher! My sister had her little step-son do that to display at her wedding, but I never thought about doing it with my own hubby. Thanks for the great ideas! i always LOVE your posts! Thanks for all of your effort in providing us with sweet ideas for our marriages. When My husband and I were dating I did a similar version of this one week when he was gone! I did a different picture each day and sent it in text. I Love the idea with the hands!! I think i'm going to have to try it!! All these ideas are fantastic!!!!! I'm totally going to do this! I think my husband will love it! Thanks for the great idea! Cute new header Cher! I'm having a new one for TwoHeartsTOgether designed as we speak! Your site is still rockin thanks for all that you do! Thanks for stopping by my blog- yours is FABULOUS and I am so excited to read more everyday! Love you blog! It's so fun to read and get new ideas. Cute idea! I love all of your ideas, I read your blog all the time! Your posts always entertain me...thanks! This is such a cute idea! I am featuring this at somedaycrafts.blogspot.com.